Quaint and cozy on the outside with porches front and back, this three-bedroom country home surprises with an open floor plan featuring a large great room with cathedral ceiling. Nine foot ceilings add volume throughout the home. A central kitchen with angled counter opens to breakfast area and great room for easy entertaining. The privately located master bedroom has cathedral ceiling and nearby access to the deck with optional spa. Operable skylights over the tub accent the luxurious master bath. 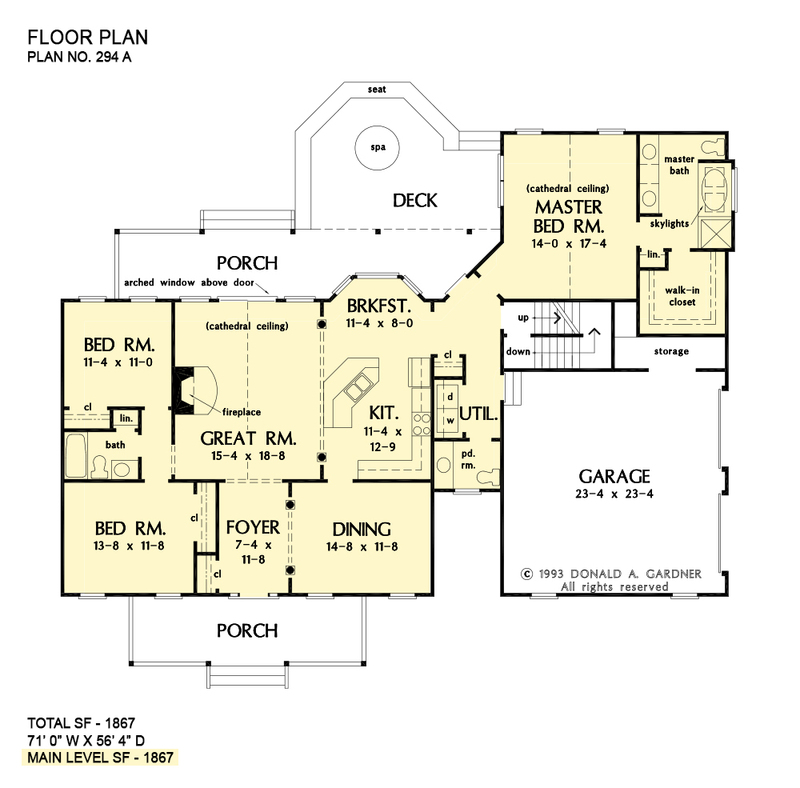 A bonus room over the garage makes expanding easy. 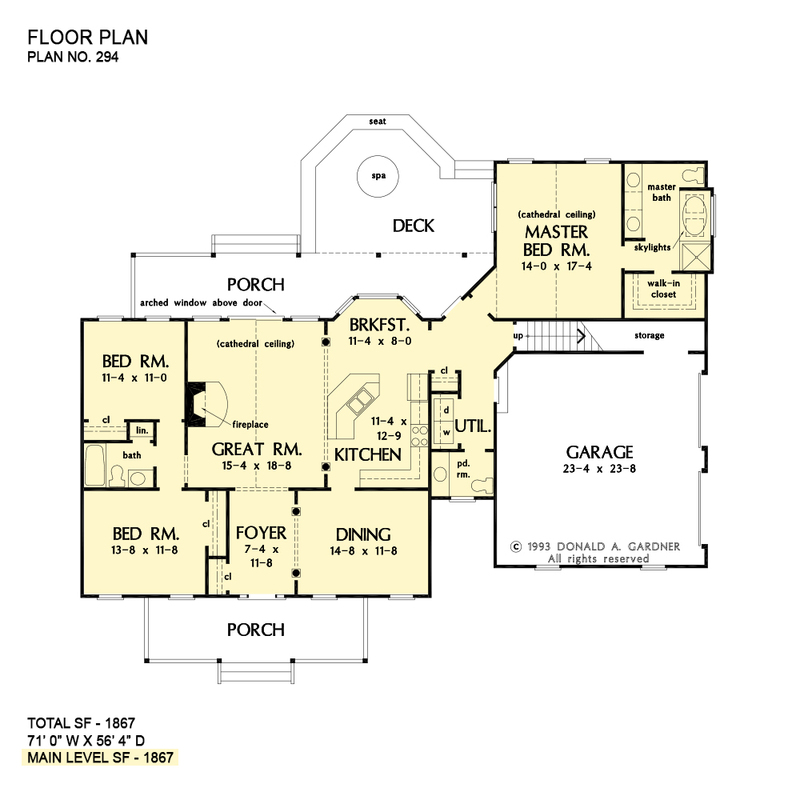 1st Floor: 1867 Sq. Ft. 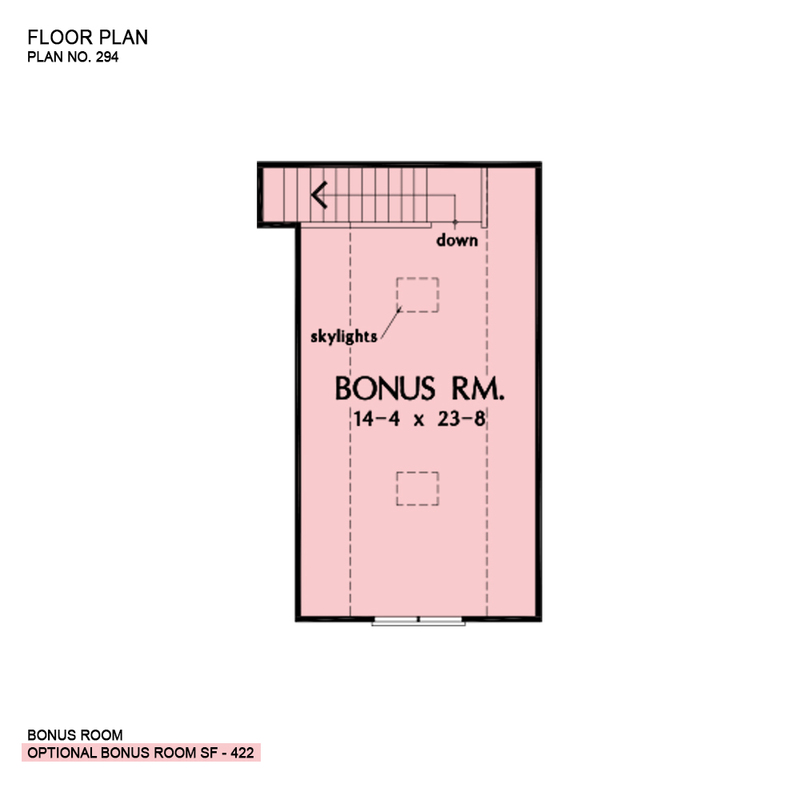 Bonus Room: 422 Sq. Ft.
House Dimensions: 71' 0" x 56' 4"
Great Room: 15' 4" x 18' 8"
Master Bedroom: 14' 0" x 17' 4"
Foyer : 7' 4" x 11' 8" x 9' 0"
Dining Room : 14' 6" x 11' 8" x 9' 0"
Great Room (Cathedral): 15' 4" x 18' 8" x 19' 0"
Kitchen : 11' 4" x 12' 9" x 9' 0"
Breakfast Room : 11' 4" x 8' 0" x 9' 0"
Utility Room : 7' 0" x 6' 2" x 9' 0"
Garage : 23' 4" x 23' 8" x 0' 0"
Garage Storage : 17' 0" x 3' 4" x 0' 0"
Master Bedroom (Cathedral): 14' 0" x 17' 4" x 16' 6"
Bedroom #2 : 13' 8" x 11' 8" x 9' 0"
Porch - Front : 25' 0" x 7' 4" x 0' 0"
Porch - Rear : 40' 8" x 7' 4" x 0' 0"
Deck / Patio : 21' 8" x 15' 6" x 0' 0"